In search of more street food in Accra, my friend Kaibo and I have been planting ourselves in the neighborhood of Nima over the past several weeks. 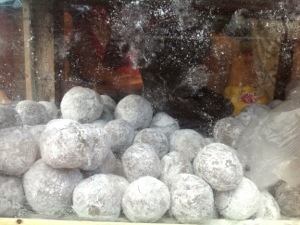 Walking in Nima, I was curious when I saw these white powdered balls neatly packed in glass boxes. I guess they caught my eye because they kind of reminded me of munchkins from Dunkin Donuts. Kaibo told me they were fura, blended molded balls of millet. Oh, don’t get confused! I have seen balls of soap sold on the street as well. But when I see them they are usually individually wrapped in plastic. Either way, please ask… I don’t want you getting sick saying “But Roxanne told me it was fura…” LOL! We will invite you next time we go street food hunting! Lol. Food-hunting. It would be fun to try more than 6 different types of local stuffs in a day. I can’t wait. Just let me know. I’ve never had any of those things. Although I’m from the part of the country where anyone will expect that I’m familiar with them. I’ll try them one of these days. 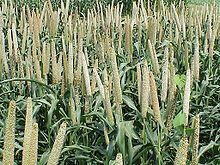 From the description – millet and milk – it doesn’t excite my tastebuds. I hope they sell them with something else. I’d need something salty or spicy to go with.